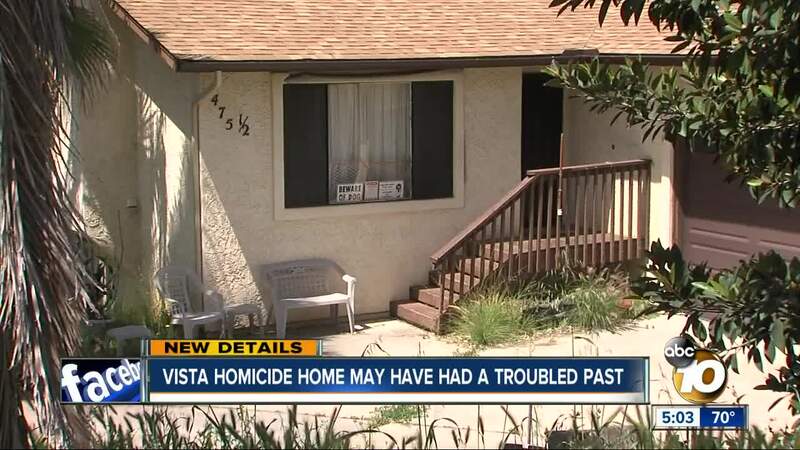 VISTA, Calif. (KGTV)- New details are emerging about a weekend murder investigation at a house in Vista. Neighbors tell 10News that a husband was arrested for shooting his wife and the two had a troubled history. A suspect in this case was arrested Saturday night by members of the San Diego Sheriff's Homicide Unit. Deputies report that he has been identified as fifty-seven-year-old Andrew Thomas Smith of Vista and he has been booked for murder at the Vista Detention Facility. He is being held without bail. The victim's family has been notified of her death. Deputies report that she has been positively identified as Jean Moore Smith, a fifty-nine-year-old resident of Vista and she was Andrew’s wife. Neighbor Chris Minster says, “Immediately, Sheriff's deputies screamed, ‘Get in your house now!’” He and other neighbors like Nicole Margulies ran inside their homes on Rancho Vista Road after there were reports of shots fired Saturday inside a neighboring home. “All of a sudden all these police showed up and [were] running inside with big guns and shotguns,” adds Margulies. The neighborhood was soon wrapped in crimes scene tape as a homicide investigation continued into the night. Deputies say a woman was killed and a man at the house was arrested. According to neighbors, that man was her husband and the father of their adult son who also lives in the home. “The father seemed actually very nice he was very defensive of his wife, despite the abuse and everything,” says Minster. He describes years of verbal abuse that neighbors say the wife directed at her husband and their son. “I would just hear her yelling. She was putting them down, degrading them [and] calling them idiots,” adds Margulies. Neighbors say the adult son may have developmental challenges. Minster saw him just after it all went down. “He had some marks on his face. It looked like maybe [there was] a little bit of blood but it looked like he was definitely attacked in some of the event that happened,” he tells 10News.